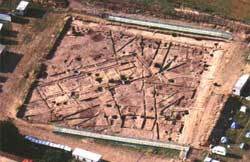 Insula IX was first excavated in 1893, the fourth season of a twenty year project by the Society of Antiquaries of London to excavate the entire Roman city of Calleva Atrebatum (Silchester). The University of Reading's excavation of approximately one-third of Insula IX (see above) began in 1997. Each year since then an enormous amount of data has been gathered, data which is managed by means of an Integrated Archaeological Database. Manipulation of these data will result in a programme of both conventional printed and on-line publication of which the Victorian excavations of 1893 is part. Within a period of twenty years (1890-1909) a programme of excavations under the auspices of the Society of Antiquaries of London revealed a plan of all the stone buildings within the walled area of the Roman town. 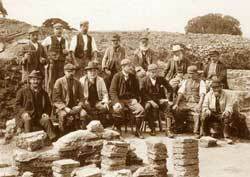 Up until now little has been known about the methodology by which the Victorian and Edwardian excavators achieved their goal, but the results of the Silchester Town Life excavations 1997-2000 and continuing are beginning to provide some evidence. © Copyright Reading Museum Service (Reading Borough Council). All rights reserved. The Web Site for the excavation season of 1893 has been designed as a gateway into our growing excavation archive. The entrance into the detailed listing of contexts, plans, finds and photographs built up during each excavation season can be made via a number of themes, each of which allows a closer look at the methods and detail of Victorian excavation and finds' recovery. The aim is to bring the campaigns of 1893 to life with details not only of the Victorian discoveries in Insula IX, but also of the lives and habits of the excavators who made those discoveries. The Web Site is designed for use not only by the casual but interested visitor, but also by those who wish to know more about the way in which the Victorian excavations fit into the overall excavation sequence. The excavation matrix is a hierarchical way of ordering site information and ultimately of phasing and dating the site. The Victorian Home Page provides access to this matrix as another means of exploring the components of the site archive. The Victorian Excavations of 1893 Web Site has been created by Amanda Clarke and Michael Fulford (text origination and editing), Ruth Shaffrey (web design and picture research), and Michael Rains (web programming and technical support). It has been made possible by a grant from the AHRB (now AHRC) for the development of an on-line archive for the continuing excavation project in Insula IX of the Roman town at Silchester. The completed electronic publication and database will be deposited with the Archaeology Data Service. The Web Site creators acknowledge the help of Dr. Hella Eckardt, Margaret Mathews, and Peter Davies, as well as the support and information provided by our colleagues Professor John Allen of PRIS, Dr Roy Brigden of the Rural History Centre, and the staff of Reading Museum. Photographs are taken by Margaret Dixon (MAPS photographic services), Anthony Sibthorpe, or the University of Reading Photographic Department, unless otherwise stated. This site makes extensive use of the Integrated Archaeological Database (IADB) system, copyright © York Archaeological Trust. Unless otherwise stated, all text, images and page design are copyright © University of Reading. At the left side of this page and all main pages in this site is the main menu bar. This provides quick access to all parts of the site. Several menu items have sub-menus which will appear when you click on the menu item. Throughout this site, this right-hand column contains links to other related parts of the site, callouts providing additional information on items in the main text, and thumbnail views of images (click on a thumbnail to view the full size image). Throughout the text, Context numbers and other references are live links to the IADB. By following these links you are logged into the IADB as a guest user and can explore all aspects of the excavation archive database. The IADB Matrix Browser provides another way in which you can explore the excavation archive, through the site matrix. Full instructions are provided on the Matrix Browser introductory page.